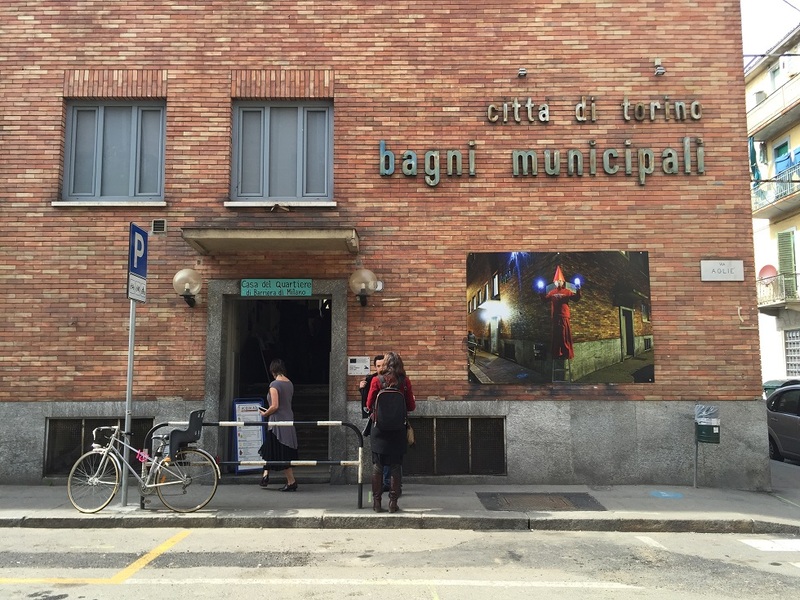 Bagni Pubblici di via Agliè 9 is a community space where more than 15 organizations, associations, traders, schools and institutions, work to improve the quality of life of their district and to encourage relations between neighbors. In this interview, Erika Mattarella presents the projects and its importance in the neighborhood of Barriera di Milano. Hello, my name is Erika Mattarella, and I’d like to introduce you to this neighborhood. We are in Barriera di Milano, a working-class district created on the town’s customs barrier. Since the beginning, many small, low-ceiling apartments characterized it and it has always had cheaper rental rates than in other parts of the city. The district experienced a huge industrial boom because there were many other companies that produced car parts on behalf of Fiat, such as electric wires producers Ceat and Incet, founded by an entrepreneur who even built schools and houses for his workers found the latter. With the end of an industrial era and the beginning of layoffs, this area lost its industrial identity, experiences struggles in its regeneration, and wide change of population. Nowadays, this neighborhood has the highest density of immigrants in Turin, amounting to an official 36% of the total population of the district, according to data from 2016 and the real percentage rises if we consider the unregistered people. Before the Second World War, in Turin there were around 40 public baths like this one. Many workers’ houses had none restrooms, others would share bathrooms among apartments, and even among those who had a bathtub, many people would only shower once a week, recycling the same water for more people. Bathing used to be very expensive. When working rhythms increased and workers needed a shower every day, public baths became essential. With the economic boom and during the 80s, many buildings were renovated and they incorporate those shared bathrooms, while most of the other units carved tiny bathrooms out of their square footage. The public bath users decreased to only four a day, not enough to sustain its maintenance. Public baths are managed by the Sport Council, probably because their structure and maintenance resembles that of swimming pools, and by law they have to keep a 25° C heating temperature to avoid thermic jumps to the users. This made the costs unbearable, and the municipality closed most public baths. When we reopened this one in 2006, there were only two public baths active in Turin. The first one is in via Bianzè, in the west called Barriera di Francia, by Bernini square. It lasted just because there were still municipal employees working inside it and there still were a few users. 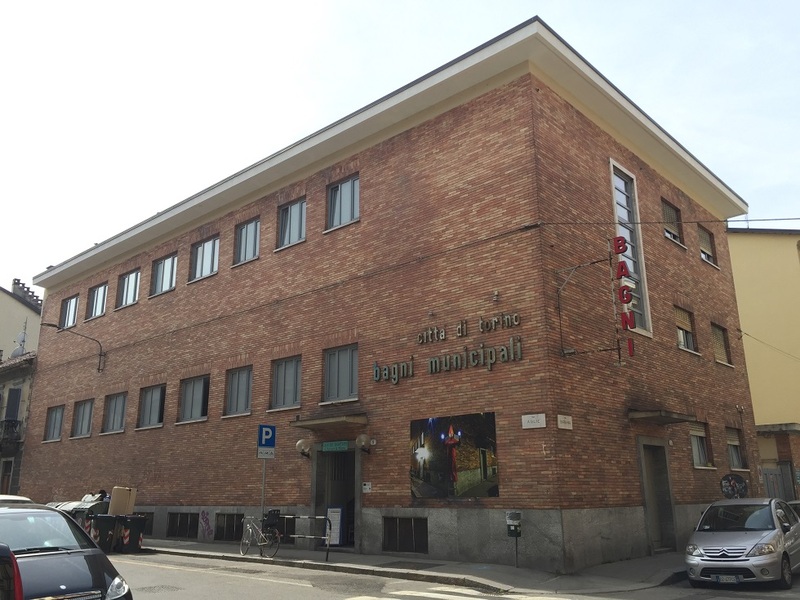 The second is in via Vanchiglia, on Corso Regina Margherita, right in the city center. The Municipality kept it open for wayfarers and homeless people. Famous Art Nouveau architect Pietro Fenoglio designed it and it’s the prettier in Turin. The bath we are now in, the Via Aglié, was constructed before the Second World War, but it was bombed and rebuilt in modern style. In 2006, during the Winter Olympics, the Municipality of Turin enacted welfare measures to fight poverty and to give the city a more welcoming look. One of them was the new plan called “Emergenza Freddo” (“Frost Emergency”). The plan included four dormitories, one in every sector of the city, to host homeless during the winter nights. Every dormitory has its own kitchen and bathroom, but here, in the northern sector, they couldn’t connect it to the water supply because on an old factory’s polluted soil. 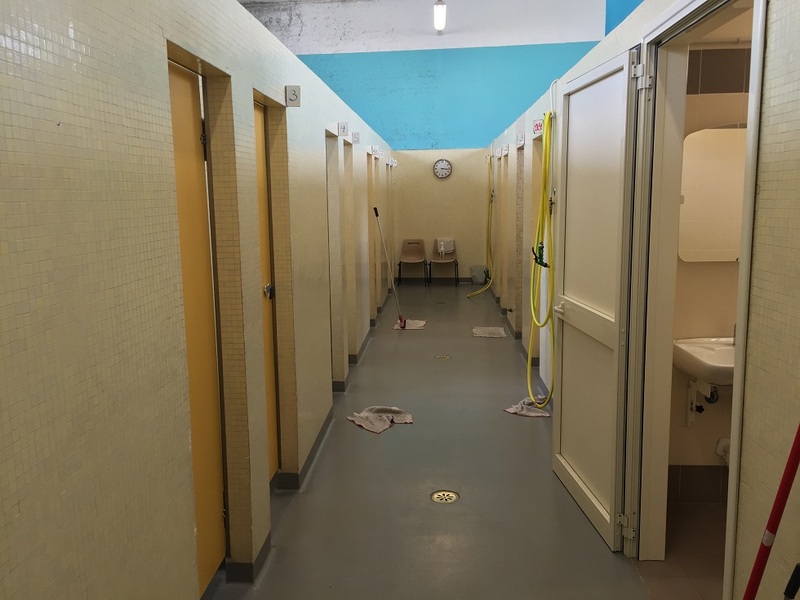 So, they reopened these public baths, allowing the homeless to use for showers. The Municipality published a public call for tenders for the site’s management, but nobody seemed to be interested in it and the district authorities involved us into the project. We were a social cooperative focused on assistance and with no experience in such big projects, but we accepted the challenge, although afraid of the huge responsibility it would imply. We renovated the building just enough to make it usable, only changing water pipes and part of the electric grid before beginning our activity. The rest of the structure remained untouched. This neighborhood is the most troubled one in the city. It has the lowest salary rates, the highest number of unemployed, immigrants and elderly people. So we tried to involve the neighborhood in our project, raising awareness on the fact that Bagni Pubblici are a primary prevention service open to anyone who may need it for any reason. We still have showers on the upper floor and people come here to use them. In the beginning we held icebreaker cooking events to encourage social interaction, and we included activities such as henna painting and hair braiding from different parts of Africa. In 2007 we joined an event called “Festa Dei Vicini di Casa” (European Neighbors’ Day), an initiative promoted by the Council of Europe involving a wide network of cities, and included Turin. The aim of the project is to encourage relations between neighbors. We impersonated an apartment block, and we invited people from the neighboring buildings, using the street as if it were a courtyard. The party had an unexpected success, over 200 people took part and we discovered people have positive memories connected to the old public baths. For the following six months, we interviewed the neighbors to understand such a big and unexpected participation. We started from the main social spaces of the area: the parish and the local market and we discovered the lack of social meeting points in the district. When this neighborhood was founded in XIX century, peripherals areas had none social spaces such as gardens or cultural institutions. We wanted to overcome this absence and to transform the public baths into a meeting point where to create social interaction and culture. As we needed funds to reopen the upper floor, we applied for a tender without having a well-defined plan as we wanted to favor residents engagement and support their requests. 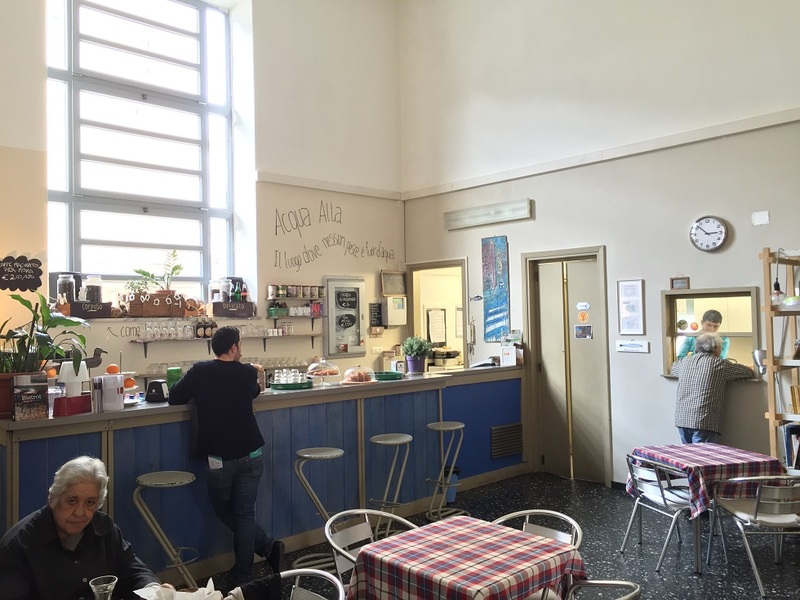 We won the call, and the public baths of via Agliè became a community center. Our aim was to bring cultural activities here, so we tried to involve city’s cultural institutions, but they did not react. There was prejudice because these are public baths but we worked together with the residents we built a shared program. For example, we have a popular jazz festival, developed thanks to a contrabass player who lives here. It started six years ago on his own initiative, when he invited musicians to play here, in our very informal “hall” that has nothing to do with the common idea of a Jazz Club. Thanks to him, we now have a free jazz concert every week, even with famous and professional artists. All our activities started in the same way. Art exhibitions, sewing classes and other activities: for instance, Andrés has been managing our theater events for years now. Some of our activities do not take place here. A retired midwife, for example, offered to assist new mothers during breastfeeding for free. It’s a particular moment that requires a discreet and comfortable ambiance, so we looked for the right place and launched a free obstetrics and breastfeeding point. One of our main focuses was audience engagement. Many people feel uncomfortable towards cultural events because they see themselves as outsiders to this world. This is why we try to give people a wider and more attainable cultural offer. Most of the people, come here for reasons other than cultural: our info point serves around 2500 users a year, looking for assistance of things such as reading a bill, editing a CV, registering their child at school or checking in online for a trip. We help them in what they need, and, we try to involve them in our cultural activities, maybe inviting them to a concert. If we compare the number of visitors with the residents, we still have a limited audience. Our offer doesn’t reach enough people yet. Recently, professor Salone from the University of Turin interviewed 600 random residents in the framework of an academic research on cultural spots in Barriera di Milano, and we found out we are the most popular one. I am sure most of the interviewees never came inside, yet they know what we do. Are you part of the Co-city program? Yes, we are. Co-City is a project run by the Municipality of Turin within the framework of the UIA initiative (Urban Innovative Action), experimenting on common goods. It began with the “Subsidiarity Reform” in Italy. In the past, the State was the only entitled to manage a public issue, but thanks to the subsidiarity reform, now private citizens can co-manage common goods together with the State. Then, jurists and lawyers from Lab—sus Association (Laboratory for Subsidiarity) considered new ways to apply the law to urban contexts. Many of the activities we manage outside our venue belong to the “local development” sector. For example, there is a group of six people who walk around the district, reporting us uncollected or bulky waste and to work legally and effectively, we need to be in touch with the local institutions. We established a direct link with the Municipality of Turin, as this place is their propriety, and we could help them fill the application for the Urban program, as we had data on the residents of the district, and we could point out the main areas in which to intervene. We won the tender and renovated the building with the Urban project. We had several issues to fix, for example, the old heating system did not allow us to regulate the temperature according to our needs, so we continuously experienced a huge heat loss. Window and door fixtures were old and some of them were broken, so we could not close them properly and the electric grid was not compliant to standards and there was no access for disabled people. The renovation cost €400.000, half of which was paid by the Municipality using Urban project’s grant, while we took out a mortgage for the other half. We made a cost estimation with the Municipality, and the money was enough to renovate the whole building, we opened our bistro and we made the place accessible for disabled people. Before the renovation it was very difficult for them to get in contact with us. I remember when we were giving legal support to the ATC tenants in debt with the company (ATC is a company that manages social housing in Turin), and to make the service available to disabled people, we used to set up a tent and build a temporary front office in the street. How could a private citizen intervene on public property, with a benefit for the whole community, without breaking the law? Before the Subsidiarity reform it wasn’t possible, but thanks to the Shared Administration, now the State can manage common goods together with the citizens, according to shared deals and a municipal employee must verify and approve their intervention. Shared administration of common goods could be used in outdoor areas, such as gardens and public parks, but it could apply to indoor spaces.To facilitate its application, the Municipality developed the Co-City project within the framework of the Uia initiative. It was a success, and the program received 54 proposals when we were only expected about 25! This shows how the citizens aspire to be useful to the community. One project is on the establishment a dog-friendly park in an area that has none: a group of dog owners started collaborating with the Municipality. A group of elderly people who live in this neighborhood proposed to create bowls court and an urban garden on an abandoned site. These projects did not require any investment from the Municipality because they took place in abandoned sites that citizens wanted to re-purpose. They only needed authorization for use. A larger project, managed by the Municipality and various associations, aims at recovering larger abandoned areas to launch different projects and activities. Now that the first projects are progressing, our role is to inform the population of the neighborhood and involve people in their activities. We also support the green areas’ maintenance. Last year, the Municipality did not cut the grass until the end of July, when normally do it between March and April. Many citizens made themselves available to cut the grass if only the public administration would have provided them with lawnmowers. To do this, the municipality had to deal with insurance coverage for the citizens involved in the works, to purchase lawnmowers and to create a shift schedule for their use and to train citizens. The Urban project evolved through time, in the ‘90s, the requalification of the Roman Spine, was architectural, while the latest Urban projects are much more attentive to the social part. Times have changed and now is harder to attract big investments in urban planning. We need money. For instance, the second Urban plan involved around 180 millions of Euro, while he third one decreased to about 50 millions. The only new urban development interventions in this area are Ex Incet and Parco Peccei. Parco Peccei, in via Cigna, was planned to be opened with the “Spina 4” development project. But the ground was contaminated and needed drainage, and the construction company failed and gave up the project, that was opened thanks to Urban, finally getting new green areas here! Are you talking about the garden in Via Cigna, is it the Dora Park? No, I was talking about Parco Peccei, in a different district. Turin had four different urban railway lines, called “Spine”. The first one was by the Politecnico, the second one is the big railway line that still crosses the city center, the third is at the Dora Park, and the last one, Spina 4”, is here. The so-called Variante 200 is supposed to be situated from Spina 4 till the Scalo Vanchiglia area. They permitted big industrial growth by allowing the factories to have their own dedicated railway lines. In fact, until the 70s, goods would travel on railways, so those big transport lines were useful, but they also split the urban space. You are part of the “Casa del Quartiere” (community center) network, how does it work? Several years ago, Turin has been one of the first Municipalities to invest European funds in the suburbs rehabilitation, and we were working in this field. In fact we used to joke and call ourselves “The Sons of Suburbs”. The Suburb plan established many “Casa del Quartiere” and for example the one in San Salvario, within the local development agency, Cascina Roccafranca, and Casa nel Parco, born from the Via Artom renovation plan. In Via Artom, for instance, in the 2000s, the municipality pulled down a big block of flats and invested in urbanization charges in services for the neighborhood, collaborating the construction company and the local development agency. Instead of building the umpteenth roundabout, they regenerated an old closed library, and they built the new community center called “Casa nel Parco” (House in the Park), renovating a neglected park called Colonnetti Park. At that time, we met several times the counselor Ilda Curti, whose earlier task was to be the director of Gate, another project within the framework of the Urban Plan. We discovered that the real goal of the Suburban plan was to involve people in social activities, and now we finally received a real place where we could try things out. We didn’t need massive investment and, we didn’t have a regeneration plan, we were simply in touch with the citizens. We are in a multicultural city district and one of your main topics is integration. Is your venue location beneficial for your purpose? Are there any differences between this one and other similar sites? This site differs from any other because it follows the neighborhood shape, considering its significant percentage of immigrants. But we never aimed to “own the site”, we were instead interested in building mutual trust with the immigrants who have always been our main public. We always involve the immigrants in the debates and in planning activities and we notice a much bigger and effective impact on the neighbors when the residents express themselves on issues. If we launch an Arabic language course it’s not our own decision, it’s just because specific association asks us to do it. We may say we are their “hardware”, but migrants are our “software”. Often you find Italian people working in intercultural centers, instead of migrants themselves. We tend to replace migrants, and they come only when they need something, in a negative dependency relationship. In Bagni Pubblici, we want to give them the chance to propose their own activities, involving them as much as possible. If I want to launch an Italian course for foreign women, for instance, I should ask a foreign woman, maybe from Morocco, Egypt, or Senegal to plan it because it will be easier for her to receive users. A venue is important because immigrants need a meeting place. For instance, every weekend we give our space to different associations for their reunions, instead of meeting in private flats and maybe disturbing others neighbors. Their events are usually well organized and “democratic”. Multicultural activities with immigrants help us see them in their real habits, away from the usual folkloric stereotypes. Morocco is not just couscous just as Italy is not just spaghetti, we therefore invite Moroccan writers to show our public that Morocco has a culture beyond couscous. It is easier to involve people with food, and if a book presentation could bring here about thirty people, a couscous night could have two hundred participants. But sometimes it’s important to try other ways. Multicultural richness could be fine in literature as much as in food. What are the largest foreign communities here in Barriera di Milano? What do you think is the reason for our wrong approach with immigrants? We tend not to trust immigrants, and we have a very paternalistic attitude towards them: “Come to me, I can help you”, instead of “come with me”. We now have many qualified and skilled second – generation immigrants, and they do not allow us to be paternalistic attitudes or prejudice. Most immigrants come from North Africa: Morocco, Egypt, Tunisia, a few from Algeria. From West Africa we have lots of people from Nigeria, Senegal and Ghana. Most immigrants come from Morocco. Even if the biggest foreign community in Turin is Romanian, they live in other areas of the city. There is still a huge misunderstanding Moroccans, reducing their whole culture to a few rural stereotypes. Practicing multicultural means overcoming stereotypes, understand and appreciate diversity. Community, Governance / Shared administration, social inclusion, Turin , neighbourhood.